Let’s your baby crawl and play comfortable with GENKI diapers! 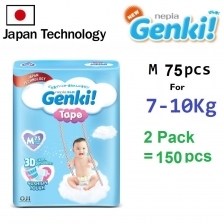 GENKI diapers has stretchable ultra-soft waist, baby won’t get hurt when they play and crawl. GENKI Diapers help prevent leakage because it has ultra-Soft elastic gathers. The ultra-absorption core help quick absorption so that your baby able to enjoy their play time. Base on Baby weight is just a reference to decide the diaper size, finally still need to check baby comforty to decide whether to use another size. There is different post, please check the title to understand how many pack.